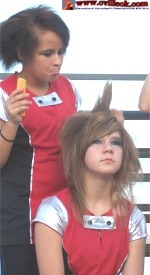 The band's Color Guard Ladies worked hard to get their unusual hair just right. Collinsville's defense stopped Skiatook on 4th and 3 near the Card's 20 yard line (above) on the Bulldog's first possession of the game Friday. 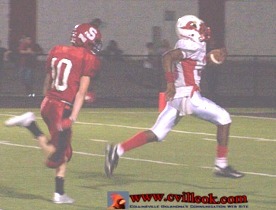 After taking over on downs, Collinsville started an 80 yard scoring drive on their first possession of the game. 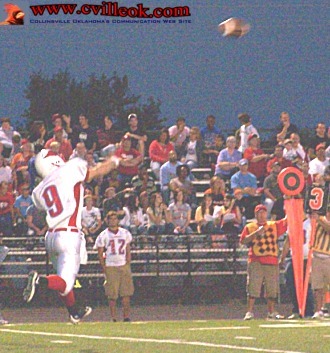 This Shane Douglas (#9) 3rd down pass was complete to John Pinney to Skiatook's 41 yard line in the Card's first possession. John Pinney (#85 left) took this Shane Douglas pass down to the 1/2 yard line (from Skiatook's 30) in the opening drive which featured Merin Oakley rushes mixed in with passes to Pinney. 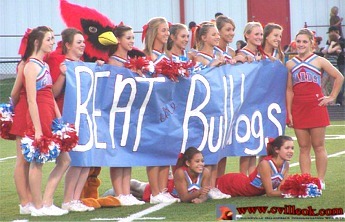 Collinsville scored the first touchdown from a half yard out at 4:11 in the first quarter. I couldn't tell which of the many Cardinals in the endzone had scored but the Tulsa World credited Jayce Crowder. The extra point kick attempt was wide leaving the score at 6-0. The kicking game was an adventure for both teams with several turnovers during the evening. Jamaro Oakley (#31) stripped the ball from the Skiatook runner (above) returning Collinsville's first kickoff at the Bulldog's 31 yard line. 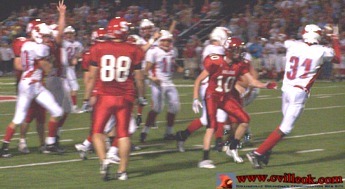 Later during the game, Skiatook regained possession on two different short punts that hit Collinsville blockers. Skiatook also apparently expected a later Cardinal kickoff to go out of bounds and instead watched Collinsville cover the free kick near the sidelines. Early in the 2nd quarter Merin Oakley (#30 in both photos above) covered 55 yards for Collinsville's second touchdown at the 10 minute mark before halftime. Steven Majike (#36) took the handoff from Dylan Weabe (#11) and scored a 2-point conversion to put the score at 14-0. That 2 touchdown lead didn't last long with Skiatook running back the ensuing kickoff ~88 yards (in the right photo) to close to 14-7 at 9:48 in the 2nd quarter. Merin Oakley (#30) scored on this 6 yard run at 6:14 in the 2nd quarter. 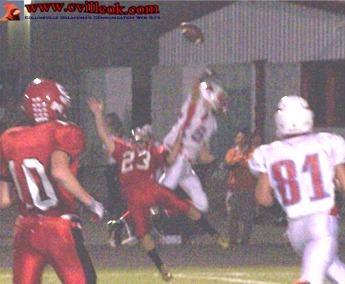 Tanner Robb (#35) was one of many blockers supporting the play. Peter Kolosha's extra point kick was good and the score reached 21-7. 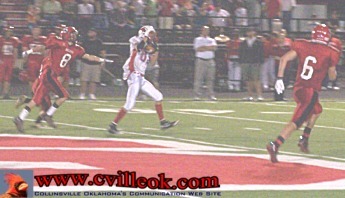 John Pinney recovered the ensuing Cardinal kickoff at Skiatook's 32 yard line. 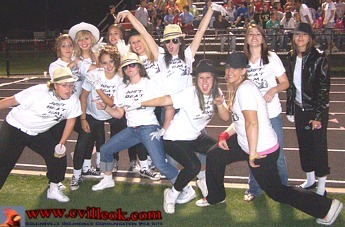 The CHS softball ladies continue to support the football team. The Lady Cards have only played one game in the past 2 weeks due to all the rain. Offsetting pass interference calls negated this play which was a Douglas pass attempt to John Pinney (#85) near the 15 yard line following the kickoff recovery at the 32. The Cards stalled and turned the ball over on downs at the 31. 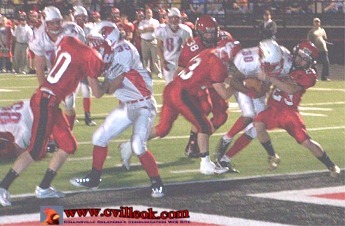 Aaron Martinez (#60) sacked the Skiatook QB late in the 2nd quarter at the 42 yard line. 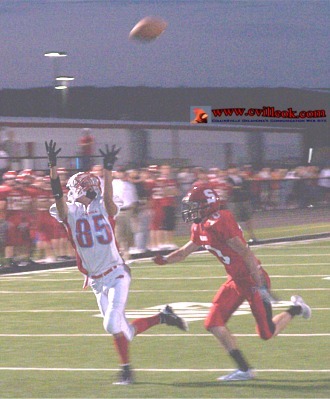 John Pinney (#85) took this Shane Douglas pass down to Skiatook's 25 yard line (from Collinsville's 28). 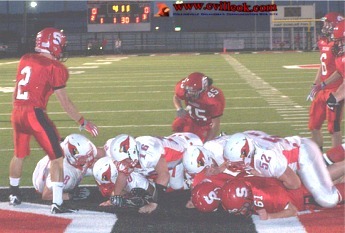 Collinsville got as far as the 9 yard line before missing a field goal on 4th & 5 with 21 seconds left before halftime.